Rotate the 3D model to see how the heart's valves control blood flow between heart chambers and blood flow out of the heart. The heart is a hollow, muscular organ that pumps oxygenated blood throughout the body and deoxygenated blood to the lungs. This key circulatory system structure is comprised of four chambers. One chamber on the right receives blood with waste (from the body) and another chamber pumps it out toward the lungs where the waste is exhaled. 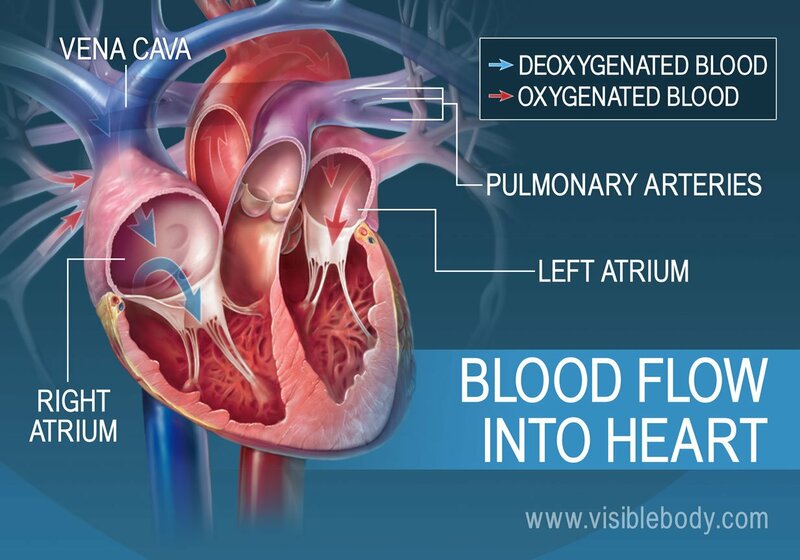 One chamber on the left receives oxygen-rich blood from the lungs and another pumps that nutrient-rich blood into the body. 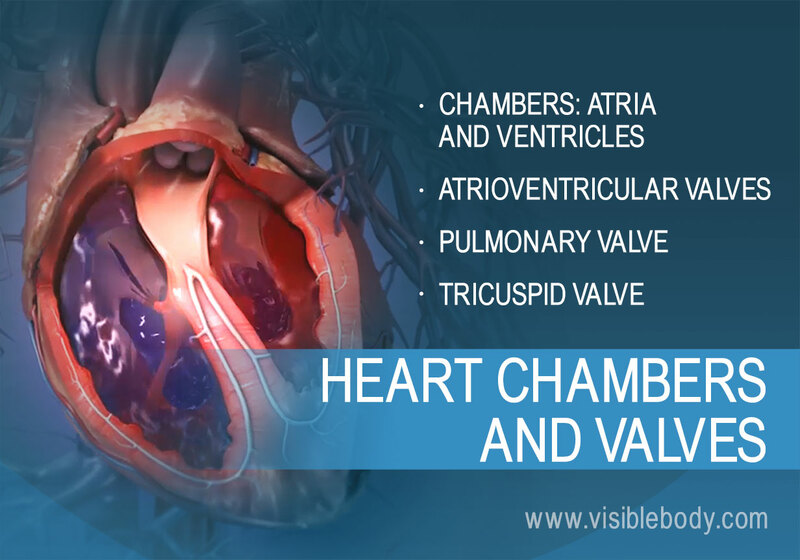 Two valves control blood flow within the heart’s chambers, and two valves control blood flow out of the heart. 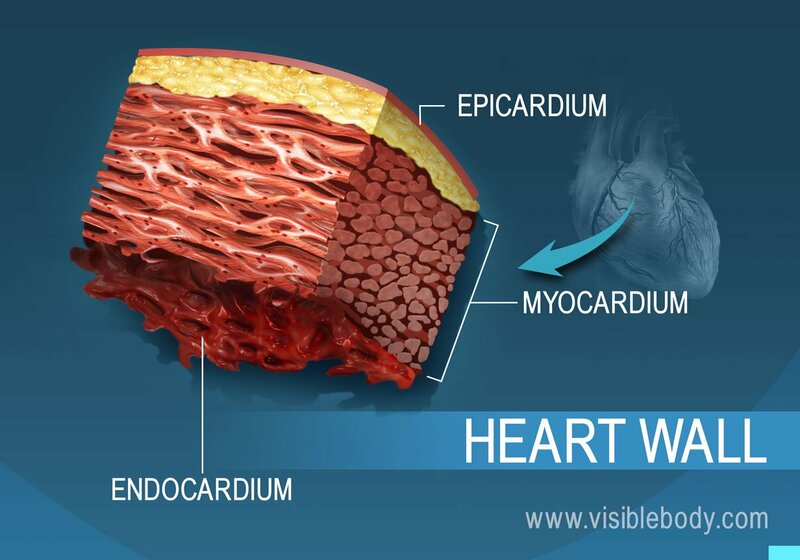 The muscular wall of the heart has three layers. The outermost layer is the epicardium (or visceral pericardium). The epicardium covers the heart, wraps around the roots of the great blood vessels, and adheres the heart wall to a protective sac. The middle layer is the myocardium. This strong muscle tissue powers the heart’s pumping action. The innermost layer, the endocardium, lines the interior structures of the heart. The left atrium and right atrium are the two upper chambers of the heart. The left atrium receives oxygenated blood from the lungs. 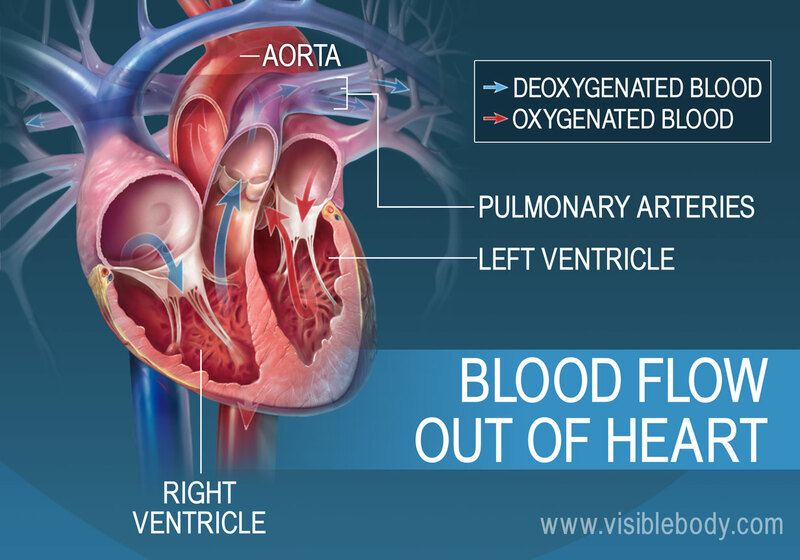 The right atrium receives deoxygenated blood returning from other parts of the body. Valves connect the atria to the ventricles, the lower chambers. Each atrium empties into the corresponding ventricle below. The ventricles are the two lower chambers of the heart. Blood empties into each ventricle from the atrium above, and then shoots out to where it needs to go. 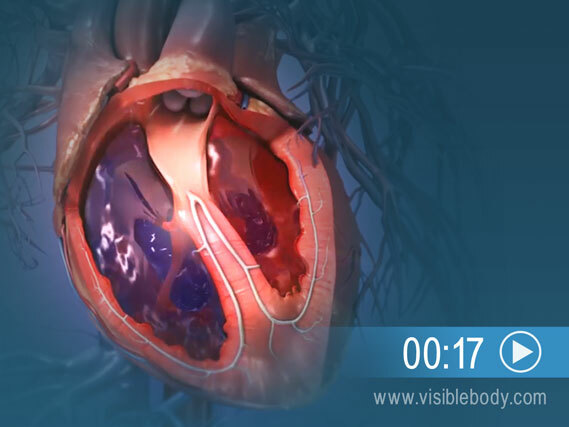 The right ventricle receives deoxygenated blood from the right atrium, then pumps the blood along to the lungs to get oxygen. The left ventricle receives oxygenated blood from the left atrium, then sends it on to the aorta. The aorta branches into the systemic arterial network that supplies all of the body. Four valves regulate and support the flow of blood through and out of the heart. The blood can only flow one way—like a car that must always be kept in drive. 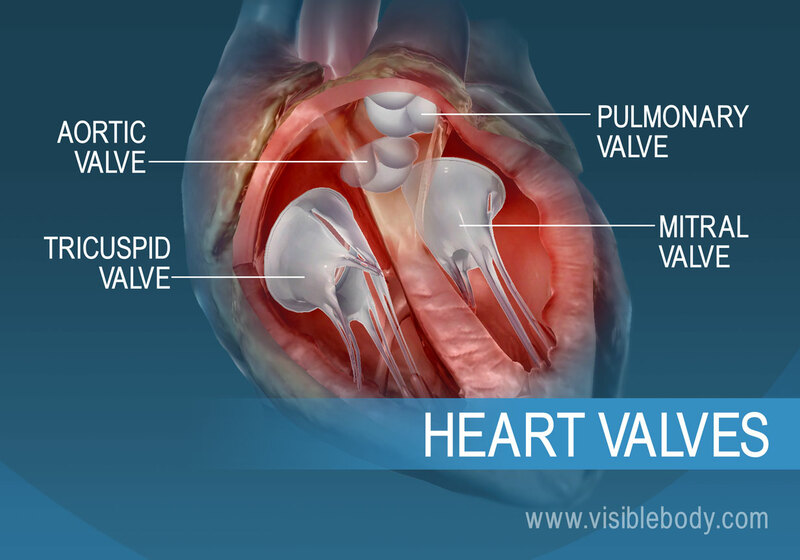 Each valve is formed by a group of folds, or cusps, that open and close as the heart contracts and dilates. There are two atrioventricular (AV) valves, located between the atrium and the ventricle on either side of the heart: The tricuspid valve on the right has three cusps, the mitral valve on the left has two. The other two valves regulate blood flow out of the heart. The aortic valve manages blood flow from the left ventricle into the aorta. The pulmonary valve manages blood flow out of the right ventricle through the pulmonary trunk into the pulmonary arteries. The muscular wall of the heart powers contraction and dilation. Each contraction and relaxation is a heartbeat. Ventricular contractions, called systole, force blood out of the heart through the pulmonary and aortic valves. Diastole occurs when blood flows from the atria to fill the ventricles. A description of the heart from the 1918 edition of Gray's Anatomy of the Human Body.